Amid the many great performances by Americans at the world indoor championships, here are five young stars to watch during the 2016 outdoor campaign. The 2016 indoor season concluded over the weekend with a rousing three days of competition at the world championships in Portland. Now it’s time to turn the focus outdoors and onto the stars who will be on display this summer at the Olympic Games in Rio. The United States made use of home-field (and -track) advantage in Portland to earn a new best total of 23 medals (13 gold, six silver and four bronze). Ethiopia netted the next most medals, with five (two gold, two silver and one bronze), while France took took home four. No other country won more than three. Amid the U.S.’s lengthy list of sparkling performances, which included impressive wins by Matthew Centrowitz in the men’s 1,500 meters and Brittney Reese in the women’s long jump, a choice few stand out as harbingers, quite possibly, of great things to come. Here are five emerging American athletes whose brilliant showings in Portland mark them as well worth watching heading toward the Olympic Trials, which are set to take place July 1-10 in Eugene, Ore. 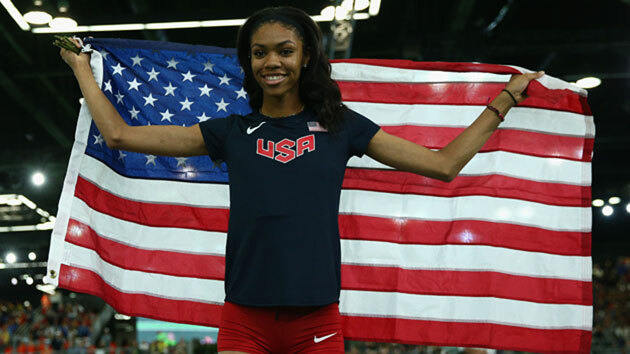 The daughter of former NFL great quarterback Randall Cunningham could become one of the youngest U.S. track and field Olympians in recent history. She became the youngest world championship gold medalist in any event with her high jump victory in Portland. After winning gold, she told NBC that she intends to turn professional while attending Las Vegas’s Bishop Gorman High, where she is a senior. Cunningham’s most formidable potential challengers for a medal in Rio may not even be present at the Summer Games. Russia has won three of the last four Olympic women’s high jump golds, but the nation is suspended from international competition due to doping violations. In London, Brigetta Barrett took silver, which was the first Olympic medal for the United States since Louise Ritter won gold in 1988. 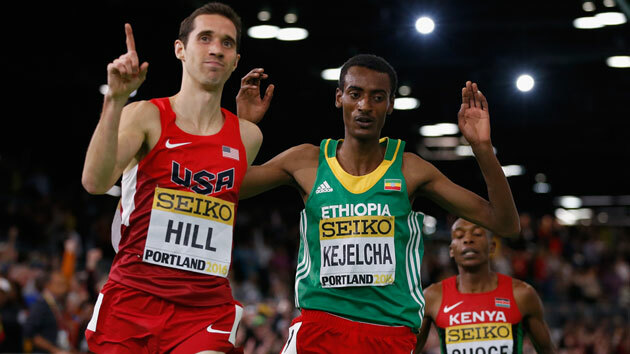 In Portland, Hill took silver in the men’s 3,000 meters with a vicious kick that propelled him from fifth place to second in the final lap. During the 2016 indoor season, Hill established himself as one of the most fearsome closers in a race as he ran the final 200 meters of his Millrose Games victory in 26.36 seconds— faster than Matthew Centrowitz’s last lap in a 3:50.63 mile. Hill won last year’s U.S. outdoor title at 5,000 meters and looks to be a favorite to punch his ticket to his first Olympics. The former NC State star has made great strides since qualifying for his first U.S. national team in 2013 and having to chase the qualifying standard, which many doubted he could do at the time. Boris Berian took zero risks in the 800-meter final as he won his first international gold medal in wire-to-wire fashion in 1:45.83. Berian was working at McDonald’s just two years ago before joining the Big Bear Track Club to train with such world-class athletes as world bronze medalist Brenda Martinez. Last year, Berian ran 1:43.34 to become the fifth-fastest American ever at 800 meters but failed to make the U.S. Championship final in the event—a rookie mistake. 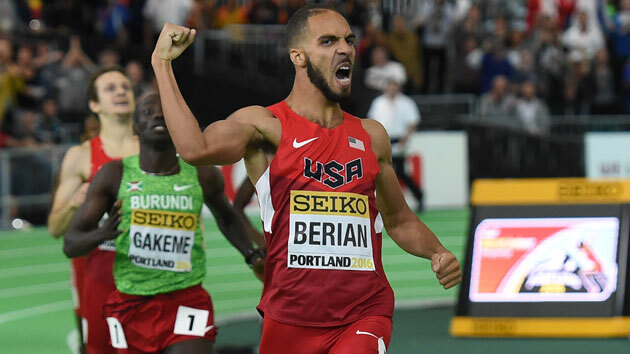 Seasoned with one full year of professional training and experience, Berian won his first U.S. title and wrote the perfect ending to his indoor season with a win at worlds. It may be the first chapter of a thrilling year for Berian. Bromell’s victory in the 60-meter final proved that the former Baylor Bear star can perform when it counts. (Also that Asafa Powell of Jamaica continues to choke in finals.) Last summer, Bromell tied for bronze with Canada’s Andre de Grasse to win his first world championship medal. 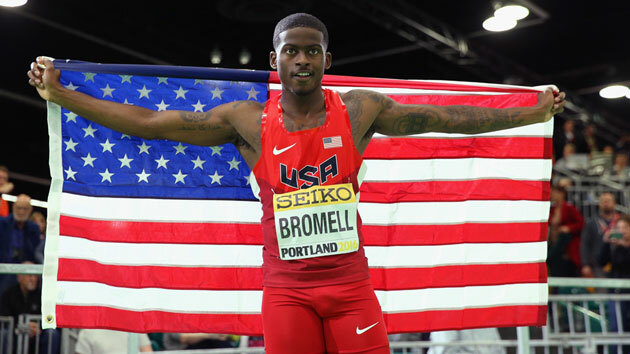 Bromell finished second at the U.S. championships and did not have the best rounds at worlds but had the quickest reaction time (0.121 seconds) and cruised to a 6.47 personal-best victory in the 60 meters. Having a full indoor season ahead of outdoors may bode well for him as he tries to follow a similar schedule to his collegiate days en route to his first Olympic team. I still can't believe this weekend happened. Morris stunned herself and the pole vault community when she cleared 16 feet and won the U.S. indoor championships with a 16”3’ clearance (4.95 meters). 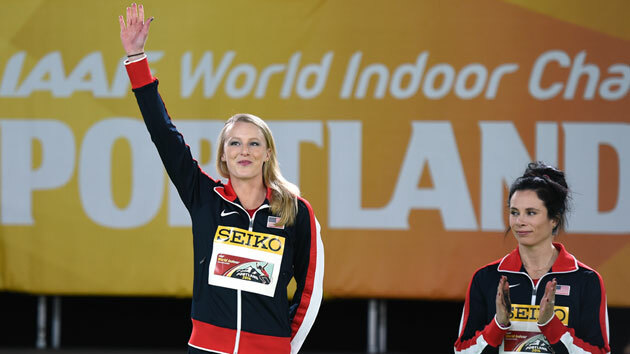 At worlds, Morris defeated world record holder Jenn Suhr before taking silver behind the reigning Olympic champion. Morris settled for silver on a day that she was not even, by her estimations, at her best. The former Arkansas Razorback has not wasted any time adjusting to the professional ranks and already has one world championship experience under her belt with a fourth-place finish last summer in Beijing. Last year was dubbed the “Year of the Vault” by the pole vault community, but that has carried over into 2015.